Your bathroom is a relatively small area compared to the other rooms in your home. A place you go to relax and shower, use the toilet, and get ready in front of the mirror. It’s also the one spot in your home where you use the most water. With so many faucets, pipes, and drains, there’s potential for plenty of water damage. Don’t be fooled into thinking it’s as simple as water collecting on your finished floor, if water finds it’s way into your subfloor, repairs quickly become expensive and time consuming. 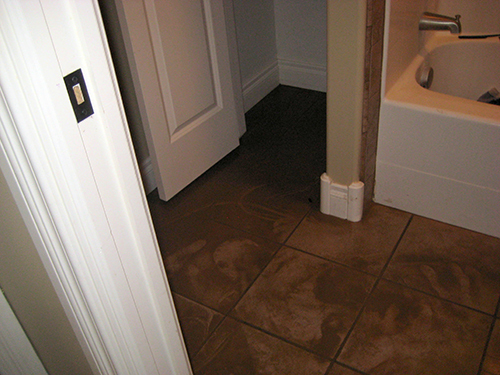 When water damage occurs, it ruins more than just your finished bathroom floor. The finished surface is usually tile, laminate or wood material. Underneath all of that material, holding your finished floor up, is your subfloor. When wood material is subject to water damage it has to be cut out and replaced along with everything else, a costly repair. Over time, your floor’s sealant will become compromised, causing cracks and gaps. As water finds its way on to your floor, it will collect and drip through. All the wood that makes up your floor and subfloor absorbs the moisture causing it to expand. This warps the wood leaving the floor uneven, bumpy, hilly, and over time this becomes a bathroom hazard. Your bathroom has more water pass through its pipes than you may realize. You shower, take baths, use the toilet, and run the faucet throughout the day. This amounts to nearly 80 gallons of water use per person each day! Now imagine the kind of damage a leak could do to your floor. With all the piping behind walls and under floors, you may not be able to detect a leak. Depending on the severity of the leak your floor may just need repaired, or it and the subfloor could have to be replaced altogether. Its important to remember, even the smallest of drips, over a long period of time, become the biggest of problems the longer they go unnoticed. Contact the professionals at Flooring HQ to answer your questions about water leaks and any other flooring questions.